The First Place Winner will receive a signed sketch cover variant of Battle Maiden Knuckle Bomb #1, with an original illustration of Knuckle Bomb drawn by Keung Lee on the cover. The First Place Winner will also have their Entry printed in the first edition of Battle Maiden Knuckle Bomb #1 and will receive a standard signed copy of the comic book, and all stretch goal items included in the Indiegogo campaign. The Second and Third Place Winners will have their Entry printed in the first edition of Battle Maiden Knuckle Bomb #1 and will receive a standard signed copy of the comic book, and all stretch goal items included in the Indiegogo campaign. Winning Entries will be printed in black and white on an interior page of the comic book. Estimated delivery of the Prizes is August 2019, but is subject to change. 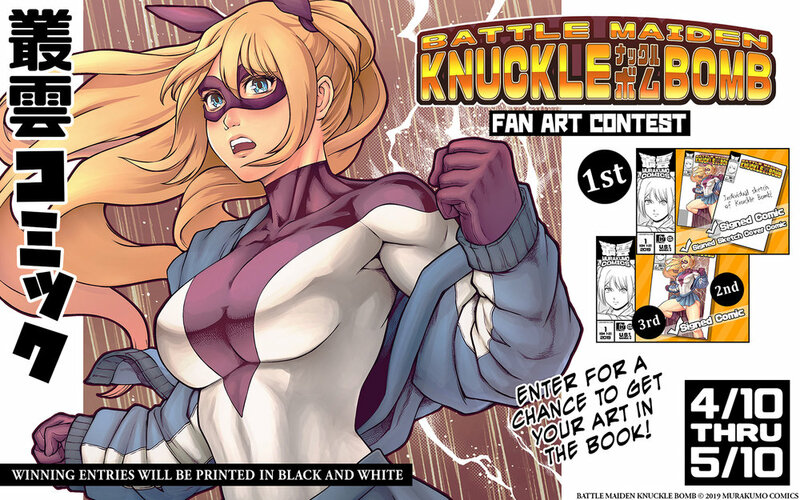 Entrants must follow the instructions provided in the rules and submit a completed entry of original artwork featuring characters from the Battle Maiden Knuckle Bomb IP. The completed entry (“Work”) may be of any visual medium but must be submitted as a JPG or PNG file. Entrants may submit as many Works as they like, however duplicate entries are not allowed. Only one (1) entry per Entrant may be chosen as a semi-finalist Entry. Entries must be received by 11:59 PM PST on 05/10/2019. The Contest is open to Entrants at least thirteen (13) years old as of April 10, 2019 and reside in jurisdiction where this type of contest is permitted. Entrant will not acquire any ownership or other interest in any and all trademarks, logos, copyrights, characters and other intellectual property of or related to Battle Maiden Knuckle Bomb or to Murakumo Comics. Entrant may not use the Battle Maiden Knuckle Bomb logo or the Murakumo Comics logo in the work itself, but may use the names within the title of the Work. If Entrant’s Work is awarded first, second or third place, Entrant agrees to grant Murakumo Comics a royalty-free license to print their Work in the Battle Maiden Knuckle Bomb #1 first edition comic book. Semi-finalists will be selected by a panel of judges and announced prior to the final judging of the top three winning entries. The judges panel is composed of Keung Lee and a handful of select independent judges not affiliated with Murakumo Comics, including professional comic book artists, writers and editors. The judge’s decisions are final on all matters relating to the contest. Final winners will be announced approximately a week after the deadline (05/10/2019). Murakumo Comics reserves the right to refrain from issuing the Prize if there are insufficient valid Entries that meet the criteria or comply with the Rules. Top 3 Finalists must be able to provide a valid shipping address for Prizes to be fulfilled. This is a skill-based Contest. No purchase is necessary to participate or to win. This contest is not sponsored, endorsed or associated with any social media platform. Contest is void where prohibited or restricted. By participating in this Contest and by accepting a Prize, each Entrant accepts the conditions stated in these Official Rules, agrees to be bound by the decisions of the judges, and warrants that he/she is eligible to participate in this Contest. Murakumo Comics has complete discretion over interpretation of the Official Rules and administration of the Contest. When submitting your Entry, please do not forget to include your First and Last name and an email address. By clicking on the “Submit Entry” button below, you agree that you have read and understand, and agree to be bound by, the above Official Rules.